Anybody want to make a guess what the above is? I deliberately made it small so that it is harder to guess as a normal sized image would have easily given away the answer. Anyway, click the image to enlarge and find out. Due to quality inconsistencies in the ZhongShan sub-contractor factory, I am finding myself going up and down more often that I would have wanted. It's a 90-minute journey up and a 90-minute journey down. If you are heading back in the late afternoon / early evening, get ready for the massive traffic jam at the HuMen Bridge which means gawd-knows-if-your-bladder-would-hold-up. So coming back, one thing about this ZhongShan place is that it is flies galore. You have these bugs flying all over the place. The paper you see in the image is a "fly paper" where it is coated with sweet smelling sticky stuff to attract the flies. Once the flies land on the paper, they are stuck for good and one less fly to bother you in the room. Unfortunately, as far as making an impact in reducing the numbers, one would be sadly disappointed for there are THAT many of these guys buzzing in the air. I guess this is more of a psychological comfort to see as many of them meeting their demise on the paper as possible when in your mind you know it is not making much difference in reducing the overall numbers. What you see on the paper is about an effort of less than 10 minutes. You open a fresh sheet of fly paper and you leave out in the open, the paper would immediately still filling itself with black dots. nadnut: Pretty normal size lah. Probably looked big due to the zoom in effect of my camera. Anyway, it's better for them to be on the paper than anywhere else. why dun u try smearing both sides with paper and throw the paper at them.... mebbe got better results ? JF: Too much trouble to have to throw the fly paper at them. 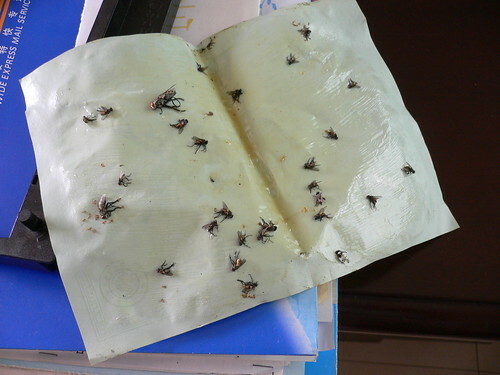 I think it is less of a hassle if you are able to leave fly paper down and pick it up at the end of the day and dispose the sheet-full of flies. Besides, smearing both sides of the paper dirties your hands which means a trip to the washroom. Again, troublesome. The anti-spam verification is much easier now loh..... we used to have to quote Pi to 25 decimal places, calculus differentiation and integration, numerical analysis, just to name a few. So disgusting.. Made me itchy..
Chocolate Gal: Bad idea to scratch. Wait later you break the skin to expose a fresh wound. Then the flies would swoop in while you were asleep and lay eggs in them. Soon you are going to get maggots crawling out of you!